Calculator is not only just a simple machine designed for simplicity and reliability to do calculations, it has many interesting facts making it a collectible. Most of us are not aware that, our father’s old LED calculator has became a collectible. In this small article, we will present the world of few number of limited keys with a small display. Logically the first Calculator was abacus, developed around 2000 BC. Around 17th century, the mechanical calculator generation came. In very old few reputed collectible shops, the brass models of mechanical calculator of 1950’s are used in the counter as an icon of glorious collection. One such shop is a Government shop in Lindsay Street, Kolkata, they uses such a fantastic model. First electronic desktop calculators were the Anita Mk VII and Mk 8, they had vacuum tubes like old radios of that time. 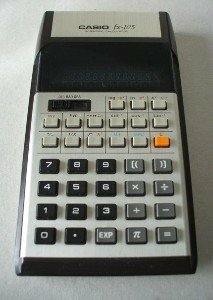 In late 1970, mostly the Japanese brands marketed a bit practically pocket-able sized electronic calculator gadgets. In 1975, Casio AL models were the first among the calculator to show the fraction. Sharp EL was the first Calculator model with a solar panel. Sharp made ? ?great efforts to reduce the size and consumption. LED was the mainstream as display until 1990, the LCD calculators became the mainstream. Casio’s fx-CG series is probably the first next generation calculator came in the market in later 2010 with the data cable to connect with a computer. TI-89 series from Texas instruments has very nice features like pretty print of the inputs. Practically all these are programmable. Just like vintage cars, with a glorious long history, calculator is a collectible too. It is quite hard to find a Casio LED calculator of 1980. If you use these models, you will understand that, today’s cheaper calculator for day to day usage are just crap in comparison with those models. The excellent green LED display, great quality buttons with nice feedback, the leather casing, all makes them a premium calculator and if you have such a good model, handle it gently as they are quite difficult to get repaired. This Article Has Been Shared 9658 Times! Cite this article as: Abhishek Ghosh, "Calculator : History, Present and Many Interesting Facts," in The Customize Windows, February 17, 2012, April 25, 2019, https://thecustomizewindows.com/2012/02/calculator-history-present-and-many-interesting-facts/.